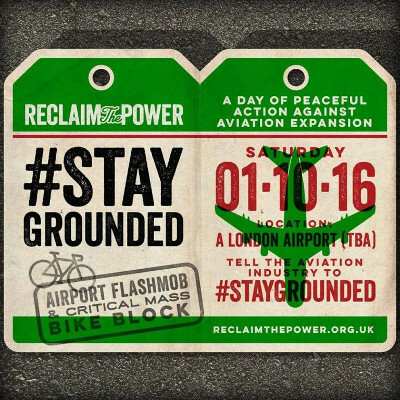 Reclaim the Power is organising a mass day of action at a London airport on Saturday 1st October, including a family-friendly flashmob. You can visit the updated plan for all the details, including time of arrival, where to meet and what you can do. In order for this mass action to be effective, at least 400 people are needed: sign up here. While UN and industry leaders gather in Montreal to push greenwash solutions for 'sustainable aviation growth', we'll be standing together in solidarity with heavily repressed sister struggles, like La ZAD in France, the Northern Forest Defenders in Turkey, Atenco in Mexico and Vienna in Austria - where people will be taking action against a 3rd runway on the very same day. This global week of action will shout to the world: No false climate solutions, No aviation expansion! On the same day, Transition Heathrow is organising a family-friendly mass bike ride from Chiswick to Heathrow, for the Heathrow Reality Check Bike Ride, to raise awareness and collectively say: enough is enough. Riders will be gathering in Chiswick Common (nearest tube station: Turnham Green) from 10am on 1 October to hear speeches by local residents and campaigners before setting off along Chiswick High Road at 11, arriving at Hounslow Heath between 12 and 1pm. The journey will flow at a gentle pace and there will be mechanics on hand if any bike problems occur! Everyone is invited to Grow Heathrow afterwards for more music. For more information, you can visit the Facebook event page.